Converting a wood fireplace to gas is not as difficult as it seems, even though most experts suggest having professionals install the necessary components. Options usually depend on the type of fireplace. A wood-burning prefabricated fireplace will need a conversion kit, but masonry fireplaces have several options. These include converting the unit to use gas logs, using a gas fireplace insert , which also makes the fireplace much more efficient , or converting the fireplace to a vent-free appliance. Before a fireplace is to be converted from wood burning to a gas one, it should be inspected. Excessive wood burning without the proper upkeep like cleaning the fireplace regularly after use, or making sure that there isn't buildup on the walls can erode the brick of a fire place and even the lining of a chimney. If there any signs of eroding walls, a professional should be called in to clean and repair the fireplace before it is converted into a gas fireplace. Prefabricated wood-burning fireplaces must have a gas line knockout as part of its structure. This is a circular indentation in the panels lining the inside of the fireplace that will allow for the insertion of a gas line. Because prefabricated fireplaces are usually installed next to combustible framing, ventless gas logs cannot be used as a conversion as National Fire Protection Association (NFPA) standards disallow ventless gas logs in these applications. Although these are touted as one alternative for conversion, many fireplace and hearth companies do not recommend installing these appliances in existing fireplaces. For one, the presence of ventless gas logs may void existing homeowner's insurance. Secondly, gases from these units escape into the ambient air of the room, which can cause problems for people with respiratory problems. Although they are more efficient than vented models, they can also put excessive moisture into the air. 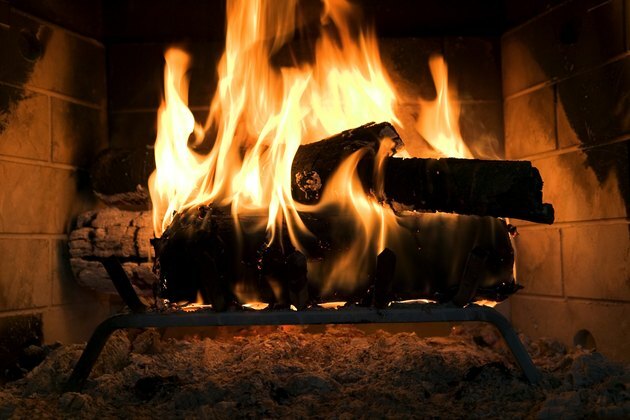 Gas logs are ceramic appliances that mimic a real wood fire. They are used primarily to create atmosphere but are not as efficient as gas fireplace inserts. In these conversions, existing dampers in masonry fireplaces are clamped open for safety so that gas fumes are not directed into the homes. For this reason, however, vented gas logs use the most gas of any fireplace conversion as much of the heat produced escapes up the chimney. Fireplace inserts are combustion appliances designed to fit into existing fireplaces. For inserts to work properly, they must be sized correctly. Proper measurements must be taken when considering a wood to gas conversion. Inserts are sealed combustion units, meaning they draw combustion air from outside. They also directly vent exhaust gases and excess moisture to the exterior. Most insert conversions use existing flues for venting. Gas inserts have fixed gas fronts with a burner and ceramic gas logs inside the unit. Fireplace inserts use gas more efficiently than any other type of conversion. Remote thermostat controls can further increase the efficiency and comfort produced by the fireplace. Can You Burn Real Wood in a Gas Fireplace?